I hate my kitchen. Have hated it for the entire 6 years we have lived in this house. It was a sneaker upper - a kitchen that I initially thought I could live with but quickly figured out that it was a true disappointment and would never be the "heart" of my home. I hate the shallow sink, the faucet, the cabinets, the amount of cabinets, the inefficiency of the cabinets, the too small fridge, the electric stove, the too low microwave, the lack of storage, the floor, etc. etc. etc. Immediately after we moved in I did some painting and took an emergency trip to Ikea to create some places to put stuff. Other than that, I mostly just pouted about the whole kitchen thing until last July when, in the midst of a bunch of power outages, my refrigerator went out. The kind of OUT that means not fixing, but replacing. But it was ok since my old fridge was too small so I was a little bit excited to be able to replace it. There was a small problem though - a matter of the three inches too big that the new fridge would be. I refused to replace a too small fridge with a too small fridge - so we bought the big replacement. That meant we had to rip out all of the cabinets on that side of the kitchen, and shrink them by 3 inches. This wasn't all bad because the space that held the microwave was too low and we had needed to fix that since we moved in. So we did the whole thing at once - (not too many pics since this was BB (before blogging). I did this all with the help of my woodworking friend - and I assure you it may have never gotten done without his help. I took advantage of this rip out to paint the cabinets inside and out. 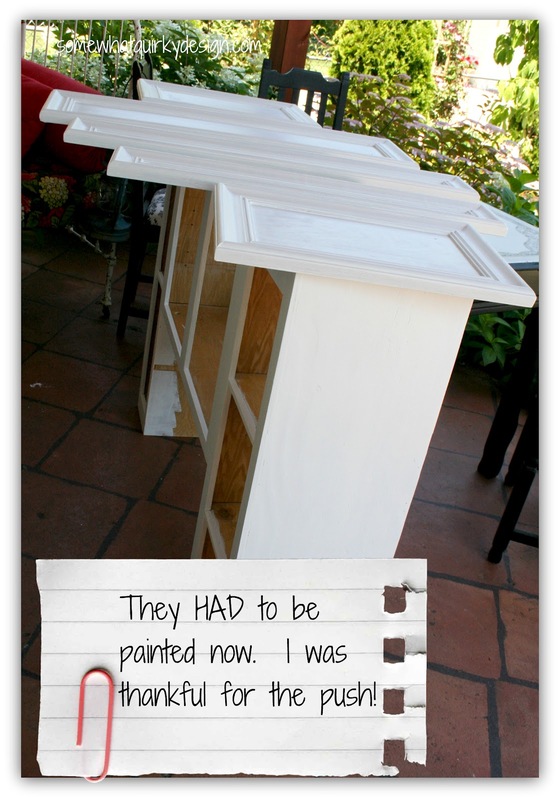 I used different colors of lavender paint samples to paint the insides of the top and bottom cabinets. They are lovely. Of course they are so stuffed with cooking things I don't get to see much lavender. 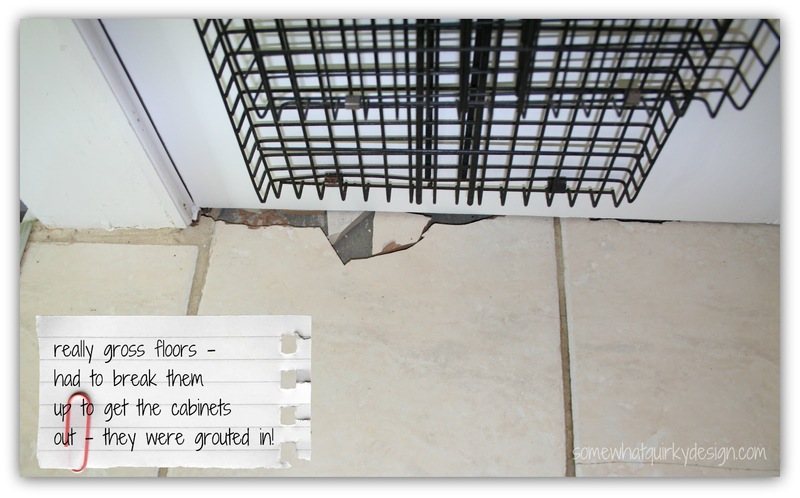 We put the cabinets back up - no small trick since the tiled floor had been tiled AROUND the cabinet bases, and we had to hammer out the tile and grout to get the cabinets out. Since I really want to change the floor we just bought some tiles to slip in and hold the bottom cabinets up. The fridge side of the kitchen was greatly improved once we got the cabinets back in. We did replace the unattractive fake tile paneling that was on the walls with beadboard paneling. I talked a little bit about that here. We still have to put up the molding and crown to finish off this side. We changed out the hinges and hardware - a big improvement. The microwave just happened to go out during this time so we had to replace that as well. I made the backsplash out of a salvaged ceiling tile - I didn't want to have to worry about the paneling above the cooktop. I lived with half of the cabinets painted and half unpainted for 5 months. Silly me. Then we invited company for Thanksgiving and that motivated me to get the rest of the painting done! 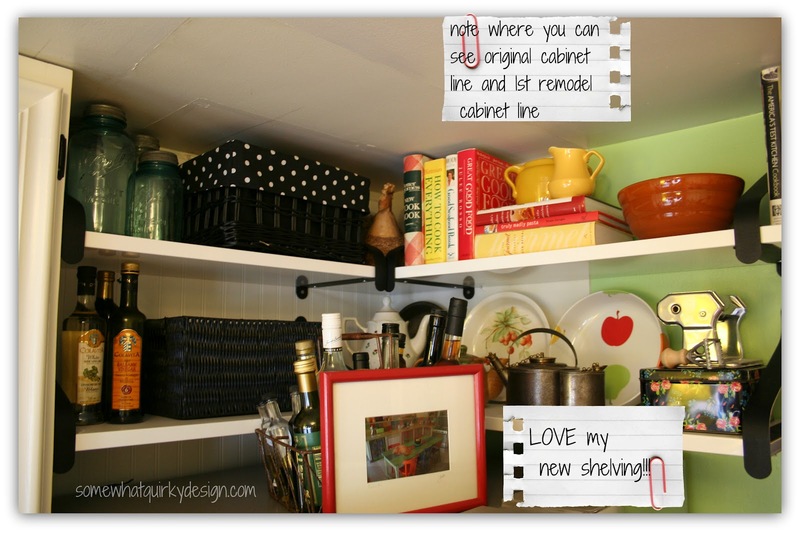 Having painted cabinets doesn't create any extra space, it just makes me much happier to be here! I still need to switch out the tile paneling for the beadboard on this side. It won't be fun, so I'm putting it off. My favorite part of the kitchen is this window. And I love my little coffee and toast station. This vintage cabinet belonged to Mr Quirky's aunt. I painted it with Rustoleum Enamel. It's the closest thing I'm going to get to an island in this tiny kitchen. It has to be moved every time we open the dishwasher but it is worth it. I try to use as many actual (really) vintage things as possible - some things just can't be vintage though. Thus vintage toaster, not vintage coffee maker. Surely this isn't for ironing???? 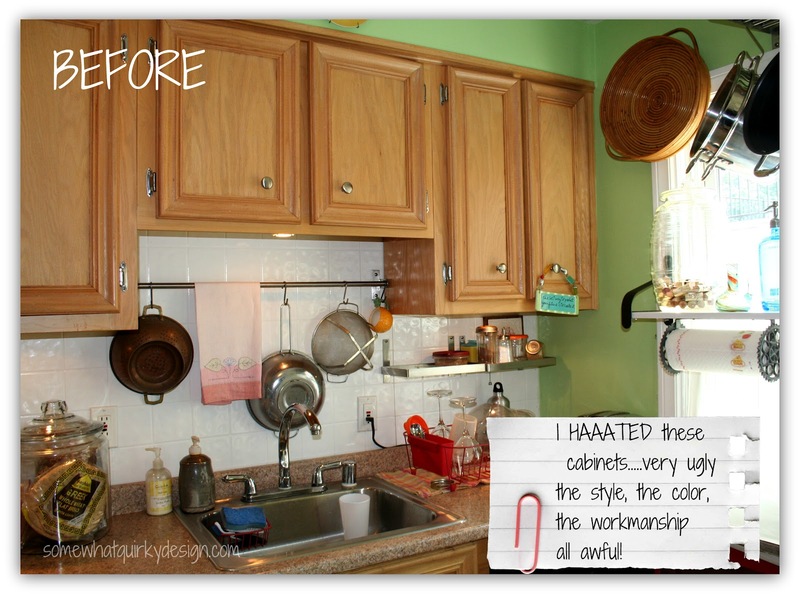 I thought I was brilliant when I used magnetic paint on these cabinet doors and put chalkboard paint over it. Not brilliant at all. The magnet just doesn't work very well. The magnets tend to fall off when I shut the doors. Oh well, I'll just have to make do with the chalkboards - but I can't find my chalk. 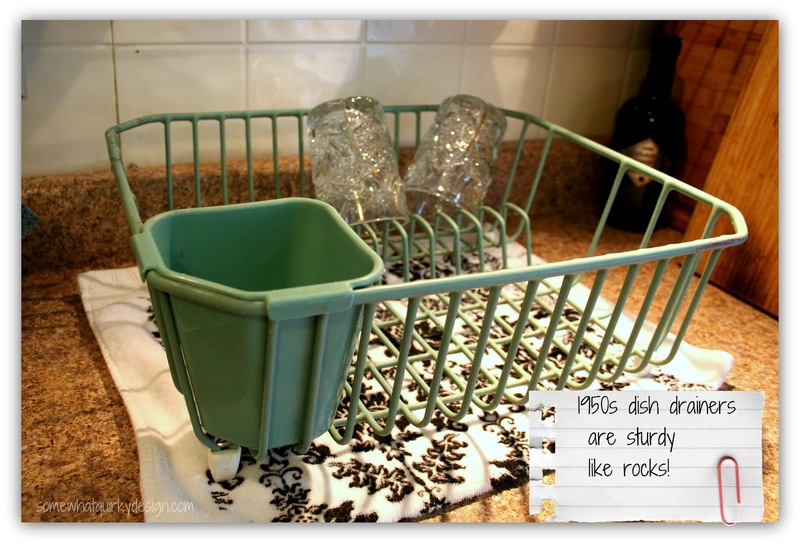 A garage sale dish drainer. I bought this lamp from a friend who was selling all of his earthly possessions to ride his bike to Guatemala. Love it. Those backsplashes were easy to make - you can find out how to do it here. My mother-in law gave me this little bee. It is a honey dish. 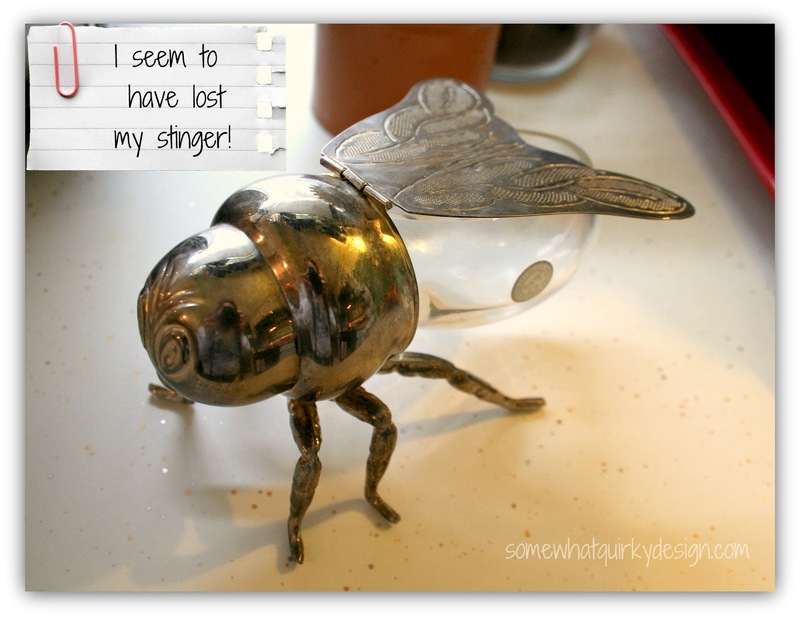 It is supposed to have a stinger that sticks out the back - the stinger is actually a honey dropper. If you find one please buy it for me! 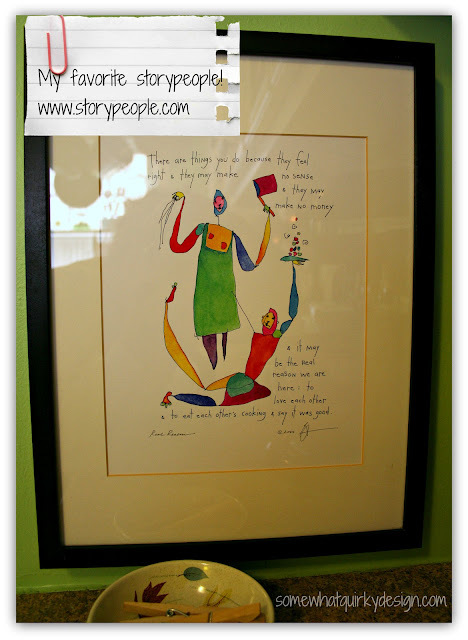 Don't you just love storypeople? This is my favorite. It says "There are things you do because they feel right & they may make no sense & they make no money & it may be the real reason we are here: to love each other & to eat each other's cooking & say it was good." My aprons aren't vintage. I like to buy aprons as souvenirs when I go on a trip. You may be wondering what this post is all about. 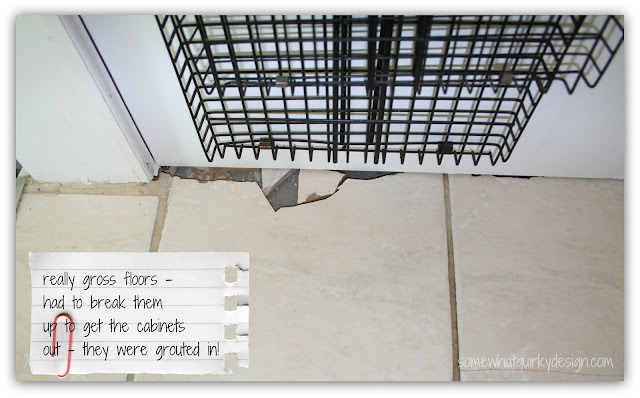 replace the floor - this will take creativity because it needs to be very cheap! My goal date is July 15. Do you think I will make it? I also have to get my back porch ready for summer, which is not going to be fast because I have to paint my chairs and make some new cushions. I also have a few other "dangling" projects that aren't really small ones. I choose to be optimistic. Wow - what an amazing transformation! 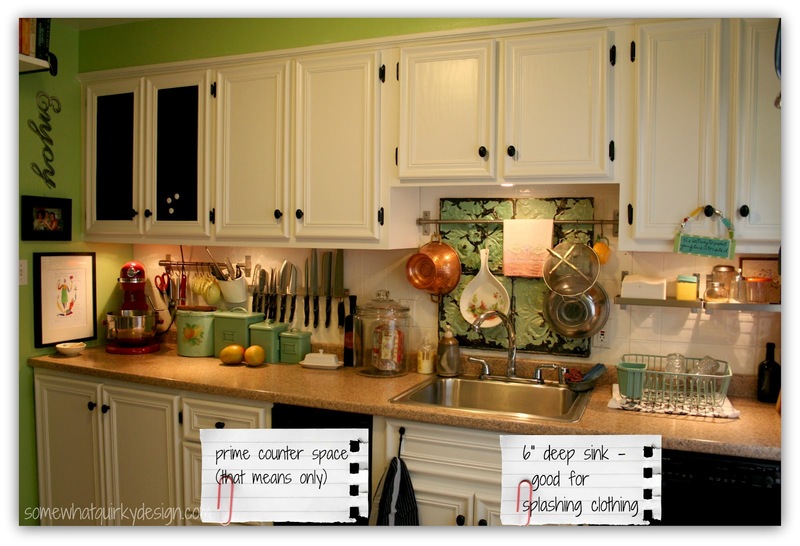 The white cabinets are fab (and love the interior color - what fun)! Love all your vintage finds - that red cabinet is fantastic and I love your little honey jar - I'll be looking out for a stinger for you! The old tile backsplash is perfect! Must be a pleasure to cook in here now. You are my color hero! It looks wonderful already and i love, love, love the colors! So cute! Big two thumbs up from me!!! Love all the colors in your Kitchen along with all your vintage goodies! The red piece with the strange board looks great. i LOVE red. My Kitchen is red. That board almost looks like a sleeve board either for ironing or for a tailor??? 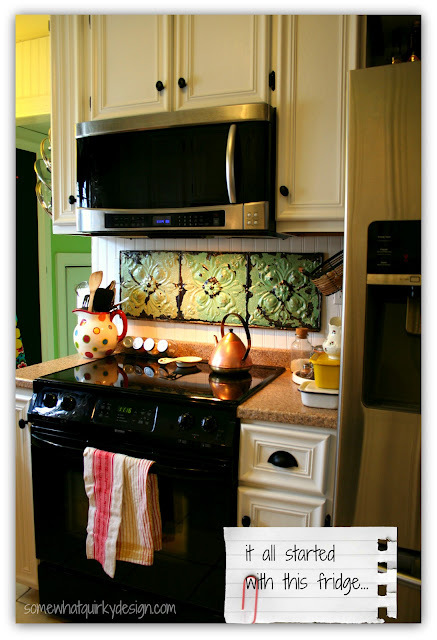 I particularly love the tiles on the back splash behind your stove!! OH how I hate MY kitchen and I've lived with it for 18 years! It's TINY, ugly, and well, it would take pages to describe it's hideousness. 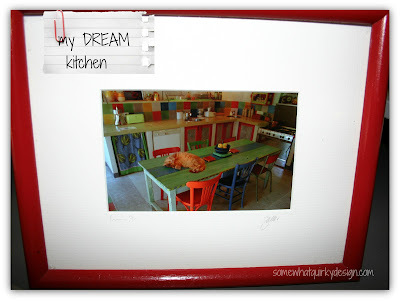 I pinned a few of your ideas on my "kitchen" board a.k.a. "in your dreams" board hoping that someday I can implement some of them! I ADORE your little Coffee/Toast Station! Seriously -- it's one of my favorite things in the whole make over! Wow! You've been busy. Your kitchen is really coming together. I LOVE the old ceiling tile backsplash!! Amazing transformation. I love the ceiling tiles behind the stove and sink. I think your kitchen is adorable! Love the colors. You've done a great job! 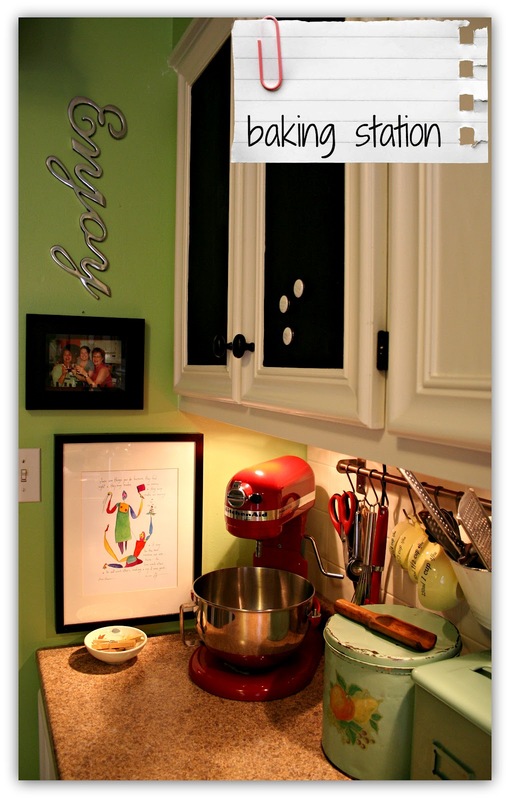 I love your little kitchen and the makeover you have done so far! I love that red toast and coffee station. I'm not a nurse-- but I've been in a Lab a time or two...and I think your red cart is a Lab table and that board is for resting a 'human arm' on so that blood can be drawn easily. (when I put it that way it sounds yucky,sorry) But I love your table anyway! I also like the green on your tin-ceiling tile, as a backsplash. I've often wondered how well the magnetic paint works under the chalkboard paint-- thanks for the info on that little project. As to your Vintage looking kitchen... I LOVE that dish rack- and the dish towel curtains! 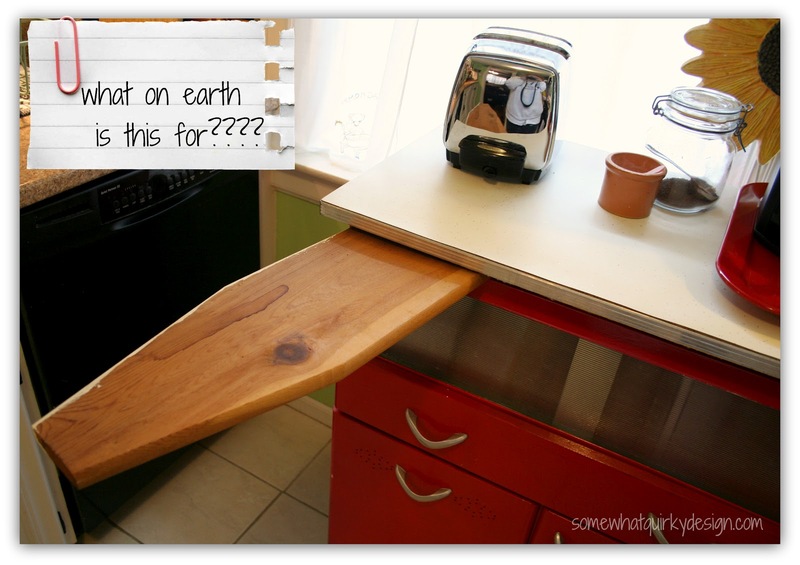 Here is a link for a similar table...sans arm rest. It even has similar hardware! 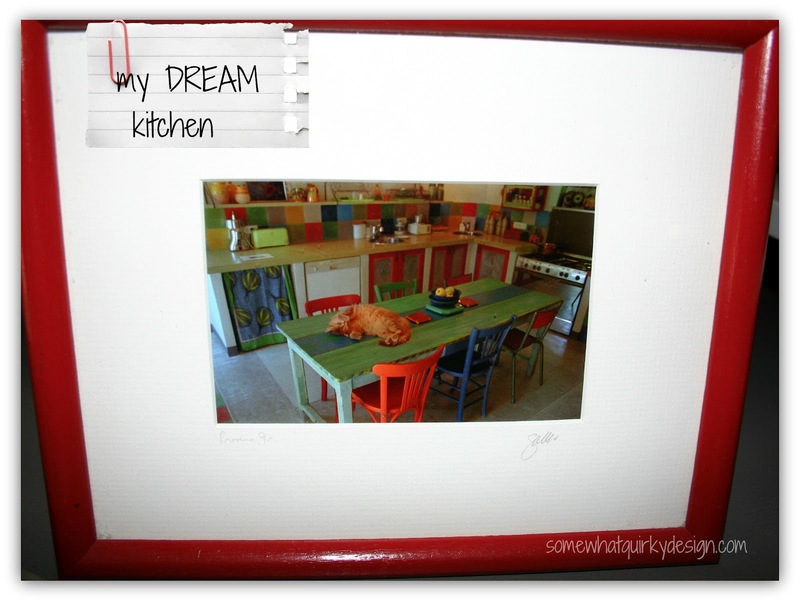 such a fun kitchen! love the ceiling tiles as backsplash, adds charm, color, texture and keeps it out of the landfill! The cabinets look so good in white, and I love all your vintage things and the pops of colour. You seem to achieve so much - I'm sure you can do it by the deadline. That looks fabulous, I love those colors!! 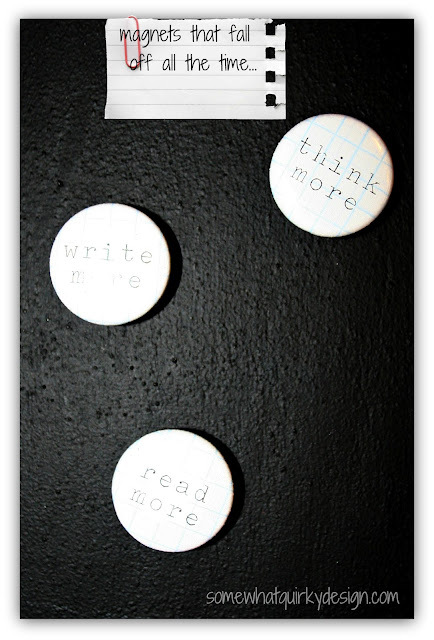 I hope you will share this (and any other rooms) at my new "May House Par-tay" at www.cheapcraftymama.com! Looking great. 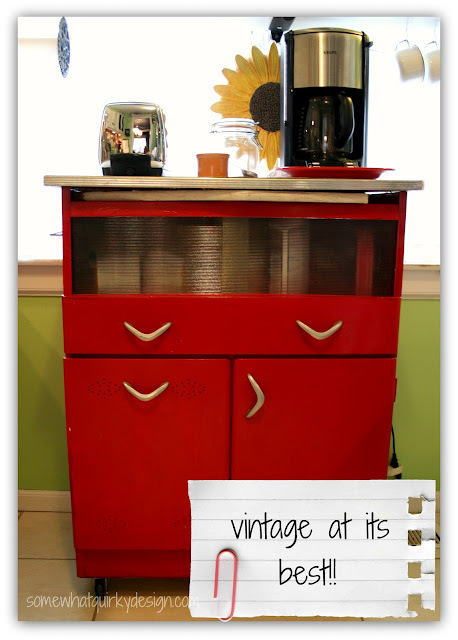 I love the little red vintage cabinet. 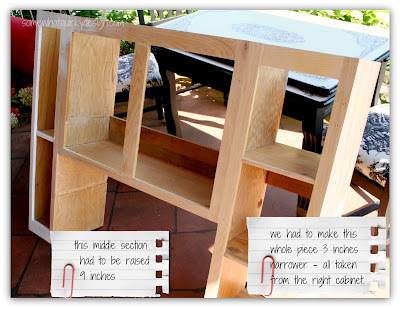 There is still time to share it at last weeks Furniture Friday @ Decorating Insanity. Wow - your kitchen looks phenomenal! 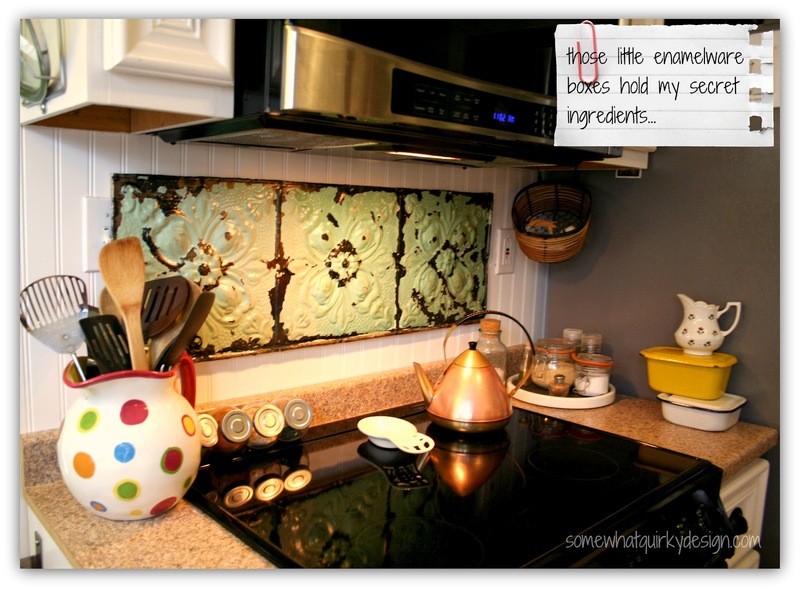 I love the tiles that you added to the backsplash and yes, I that looks like and ironing board to me! Love the kitchen! 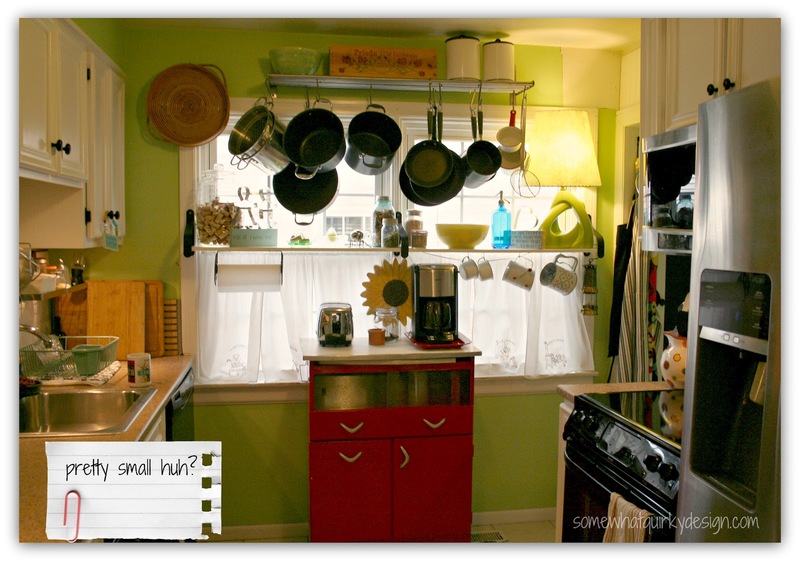 Thinking on my fav's here...... the curtains.... the hints of green especially the tin above the stove..... and the cabinet with the chalkboard. 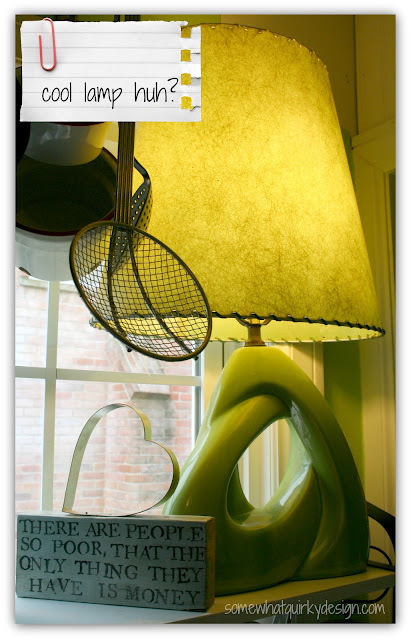 Holy smokes I love all the color,the story people, the green lamp! I love it all and it was a great springboard off your inspiration photo! Hi Karen! Your kitchen is just wonderful. What a difference just painting the cabinets makes. I love white kitchens. Your tiles for backsplashes are wonderful! You're so creative and I love all of your sweet vintage things all around! You did a great job. You have a great transformation so far! 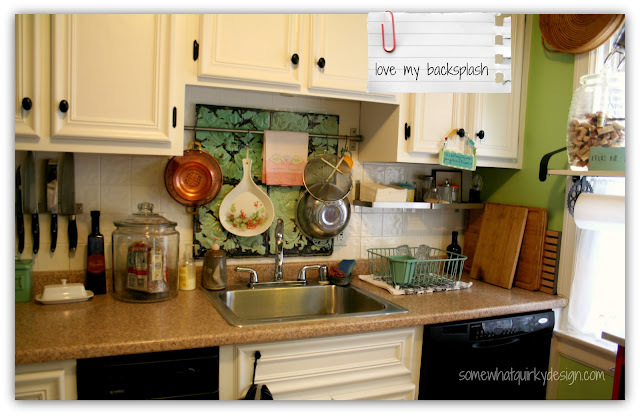 Love the tin backsplashes! Doesn't it seem like the "to do" list never gets done! Looking forward to more projects that you link up with us @ "Toot Your Horn Tuesdays". Cute! This looks wonderful and i really love the colors! Oh my goodness, Karen! I don't know where to start. Your kitchen rocks, like BIG TIME! 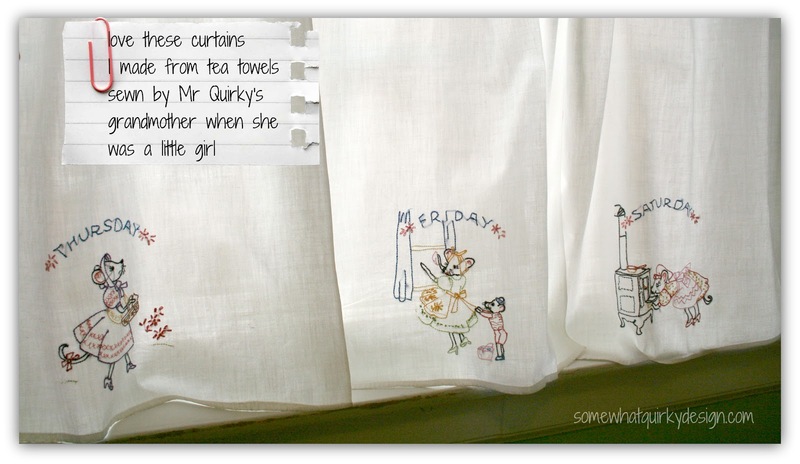 Your quirky style (like that awesome green lamp and your curtains from tea towels... which btw is so sweet that they came from Mr. Quirky's G-ma...LOVE IT!!!) is so much fun! I'm so happy I stopped by for a visit today! Yes, Quirky Lady, the enamel paint is truly the look I have thought of going for, if I don't remove all the paint and go for a metal looking cabinet. I have a feeling I will attempt the paint removal and grow weary. When that point comes, I'm glad to know about this paint. Now I have to go click the link to see about those backsplashes. I had been admiring them the whole time I was reading your story. Thanks for pointing me here for my metal cabinets. Like you, I have lots to do to get things in shape and meet some deadlines. I can use all the help and ideas I can get. Great little toast and coffee station. So cool. The whole kitchen looks fun and like you would really enjoy being there.